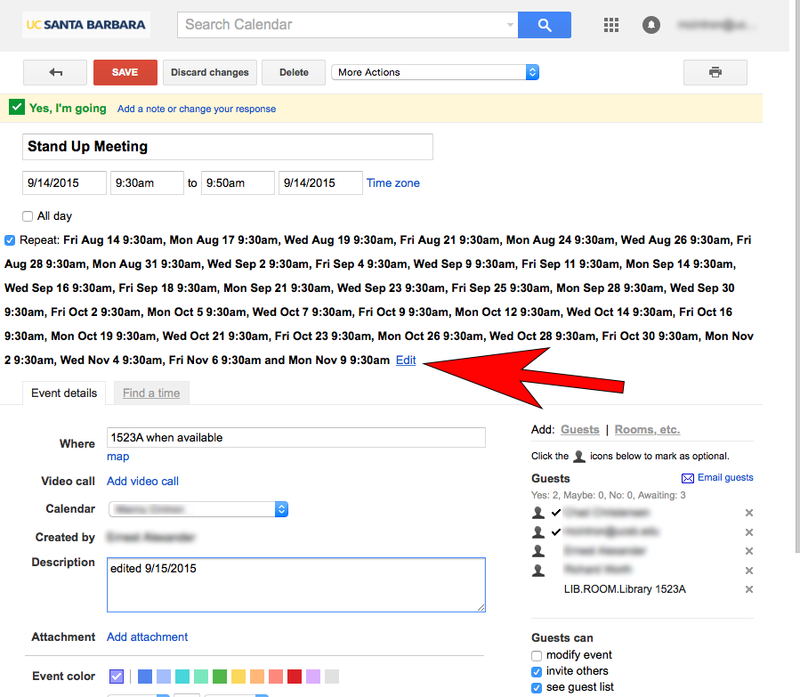 Click on an Event title in your calendar, or click on the event and select More Details to bring up the event editor. Take note of the reccurance pattern. If the event only meets at a single time you can proceed to the next step by clicking Edit. If the event meets at different times on different days then take note of the 2nd time as you will need to follow the How-To Duplicate an Event in the next section of this page. A box appears allowing you to adjust the recurrance rule/pattern. 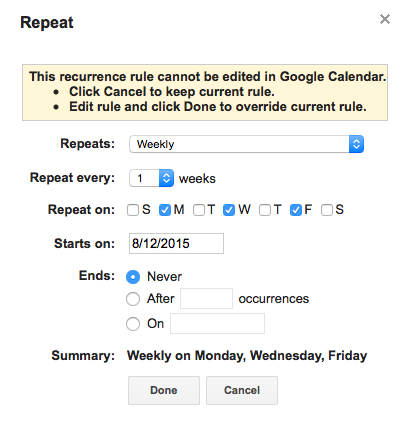 Note how Google is warning you that the current rule cannot be edited so we are going to OVERRIDE it. The meeting above met Mondays, Wednesday & Fridays at the same time so we checked which days it repeats on in this window. Click Done when you are finished editing. Note how the complex repeating pattern is gone and it simply says the event Repeats Weekly on Monday, Wednesday & Friday. 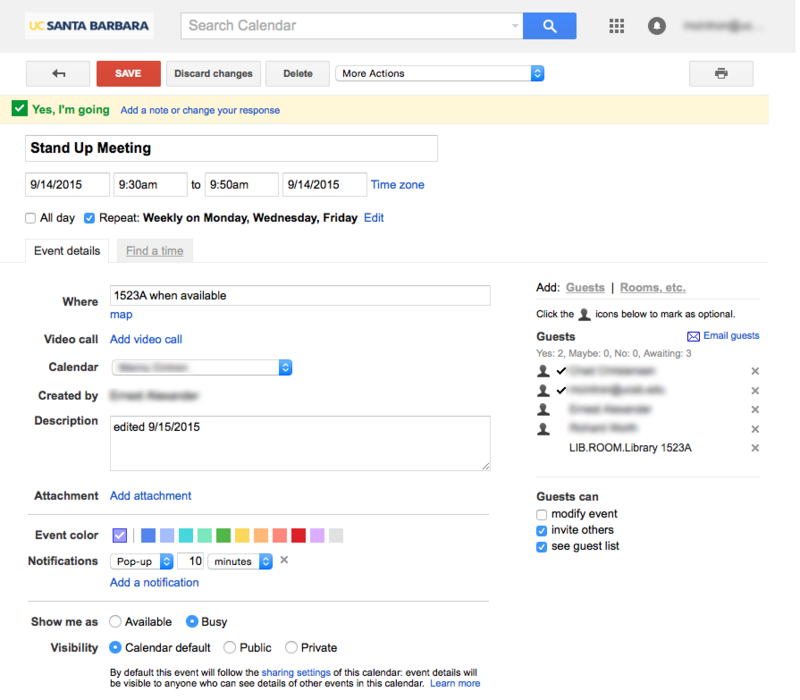 This meeting will now likely sync into Outlook/iOS/Apple Calendar now. All of the invitees are still there and their calendars will get updated as well. You may be prompted if you want to edit all occurances of this event. Choose All events. You may also be prompted if you want to send updates to invitees on this meeting. This will trigger an email being sent to them so it's up to you if you want that to happen. If you have a recurring meeting that meets at different times on different days you will first need to follow the guide above to correct the event for the first meeting time. 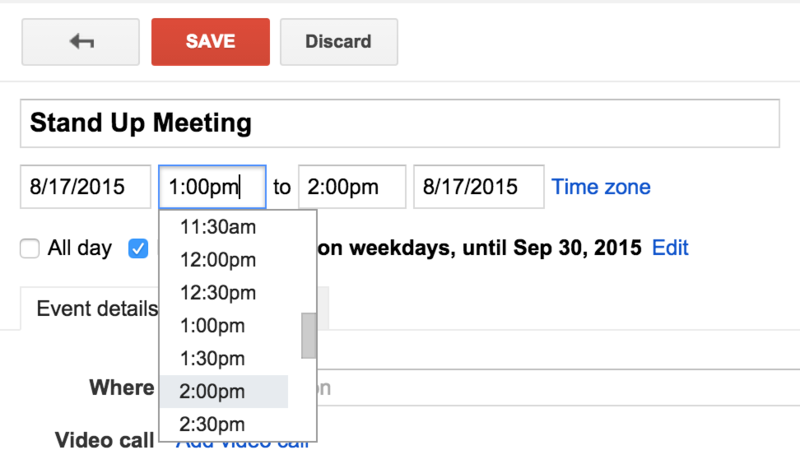 To add an additional meeting time you must Duplicate the event. Again, edit the event that needs the additional time. This time look for the More Actions option from the select list and click on it. Choose a new time. Note that all of your guests are still included in this duplicated event saving you time from having to re-invite them all. You can change any of the details of this meeting such as the title. You may also be prompted if you want to send updates to invitees on this meeting. This will trigger an email being sent to them so it's up to you if you want that to happen. In the case of a duplicated event it's probably best to send the invitations.